One sure way to get your spouse or significant other upset is to say something using the wrong tone. Your tone has everything to do with your delivery. It will make a conversation or break it. Over the past week, I have heard this four letter word (tone) in several conversations. Each time that I have heard the word it was in a discussion with married couples. So this week, I was inspired to write about our tone. Take a few minutes to evaluate the following: How is your tone? Does your tone say respect or disrespect? If you are not sure, ask your spouse. Tone, Tone, Tone! What exactly is your tone? So glad that you asked. Tone is defined as a way of sounding, modulation, any sound considered with reference to it’s quality, pitch, strength, sources, etc. Tone is the attitude of the speaker. Let’s talk about how your tone affects the way that your spouse responds to you. “Where are you?” This is a simple question so how could it create an argument, harsh feelings or be offensive? Men seem to have a problem with this question if it is said with the wrong tone. This very question used to be an issue when I first got married. It was as if it triggered something in my husband. He would respond with an attitude, and I didn’t understand why. He said this question made him feel like he was being “checked up on.” In other words, he took the question as if I thought he was doing something that he should not be doing. He later learned that I didn’t mean anything by it, I was only asking to see how close he was to coming home for dinner. Last week, I heard another husband express that he doesn’t like being asked “Where are you?” or any other question when his wife uses the wrong tone. Proverbs 15:1 says, a soft answer turns away wrath, but a harsh word stirs up anger. God wants us to watch our tone. The wrong tone stirs up anger. A soft tone creates a better response. Someone once said that you can get a person to do anything that you want them to do, if you learn to say it with the right tone. Using the right tone is necessary for men and women. 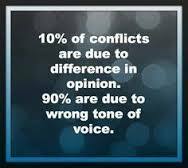 The wrong tone can cause an argument, shut down communication, intimacy and ultimately the relationship. Whenever you have to discuss a difficult topic, pray first. Ask God to give you the right words to say and to help you say it in the right tone. If your spouse has previously offended you with their tone, forgive them and discuss it. They may not realize their tone. Realize that you can catch more flies with honey than with vinegar. Ask your spouse, if he or she is pleased with your tone. Don’t get offended if they say no. Work on it. p.s. If you missed the radio interview, you can go to http://www.realtalkwithchrisrichardson.com and listen to the recorded interview at any time.